The CTT series from Automation Direct are multi-function digital units. They incorporate a multi-function digital counter, timer and tachometer all within the same unit. Tachometer mode will bring in pulses that can be from a sensor, incremental encoder, etc. and convert this to a rate. Rates such as speed or frequency deal with units per time. The CTT makes converting and using these pulses easy. The tachometer mode has four different output settings; 2Lo1Lo, 2Lo1Hi, 2Hi1Lo and 2Hi1Hi. We will be reviewing the tachometer mode of the CTT and programming a rate based on the frequency of a relay output of a PLC. Let’s get started. Continue Reading! 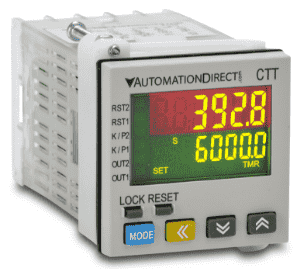 The CTT series from Automation Direct are multi-function digital units. They incorporate a multi-function digital counter, timer and tachometer all within the same unit. The counter mode will operate in five (5) different ways. Up to five different count input modes can be selected. Up, Down, UP/Command Counting Down (UdA), UP/Counting Down (UdC) and Quadrature (UdC) can be selected. We also have a number of output modes to select so this unit can adapt to a great number of applications. We will be looking at each of the Counter modes using the Up count input on this versatile digital unit. 1-Stage, 2-Stage, Batch, Total and Dual are the modes. Let’s get started. Continue Reading! The CTT series from Automation Direct are multi-function digital units. They incorporate a multi-function digital counter, timer and tachometer all within the same unit. The timer mode will operate in twelve (12) different ways. We will be looking at each of the timer modes on this versatile digital unit. Let’s get started. Continue Reading! The CTT series from Automation Direct are multi-function digital units. They incorporate a multi-function digital counter, timer and tachometer all within the same unit. This means that you have fewer stock items and the learning curve is minimized. The CCT series are easily configured as a digital counter, timer, combination timer-counter or tachometer. The two colour LCD display shows present values, setting values and menu parameters during setup. Process control parameters are easily set using the externally accessible DIP switches or the lockable keypad. We will be looking at this versatile multi-fictional device. Let’s get started. Continue Reading!